Coach's Corner - Mickey Mantle certified Yankees 1957 MLB contract. Go Back to Lot List Mickey Mantle certified Yankees 1957 MLB contract. 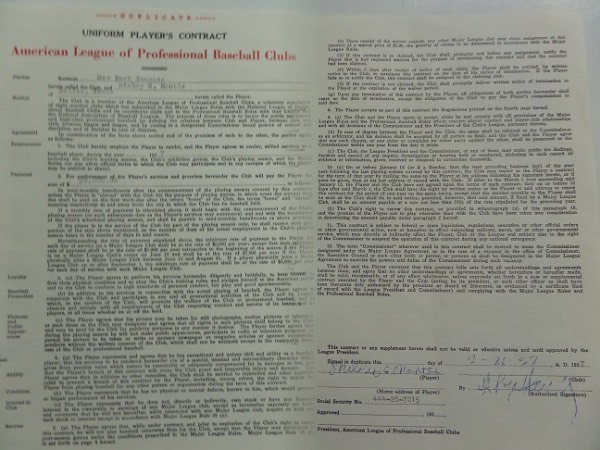 This historic contract is dated from 1957 and payed Mantle $60,000 per year. It comes ink signed by Mickey, dated as well, and even has his social security number listed. It is 2 pages long, in like-new condition, and comes certified TWICE. I see a Chris Morales forensic letter on his signature, and this piece was sold at the Pat Olsen estate sale a few years back. He obtained it right from the Yankees in 1958, and authenticity is assured.